On Monday, 8 December 2014, Indonesian police fired on a group of civilians, killing five people. Local sources allege that a large group of civilians had gathered to protest the beating of a 12-year-old boy by Indonesian police the night before, but this version of events has been disputed by the Indonesian authorities. 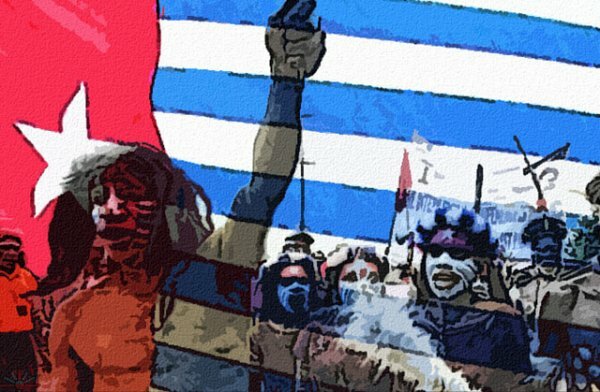 Five West Papuan people were shot dead and 12 others injured when Indonesian troops and police fired into a crowd of civilians in the highlands region of Paniai on Monday [8 December 2014]. The facts leading to the incident are in dispute, but tensions remain high in a province that has hosted an active but low-level separatist insurgency since the 1960s. Papua police chief Yotje Mende confirmed to a local newspaper in Jayapura that the police officers had fired the fatal shots. "The shooting was triggered by an attack on the Enarotali police precinct. Our members only tried to protect the office," he said. Local sources quoted by newspaper Suara Papua say the crowd had gathered in Karel Gobay Square in Paniai to protest against a group of Indonesian soldiers, who they say had beaten a 12-year-old boy the previous night. On this version, a group of boys aged 12 and 13 stopped a military vehicle on Sunday night to complain that it was being driven without headlights. Newspaper editor Victor Mambor, from Tabloid Jubi, also quoting local sources, said the boys were living in a small house they had built by the side of the road — a common feature of Christmas celebrations across Papua. After the boys had stopped them, the driver and passenger of the military vehicle returned to their base in the village of Madi, and then returned to where the boys were, bringing with them a group of fellow soldiers in trucks. The soldiers then beat at least one of the boys, the local sources said. Mr Mambor said that, on Monday [8 December 2014] morning, a crowd gathered to protest, and attacked a military vehicle, at which point the police and military fired into the crowd, killing five. Military spokesman Rikas Hidayatullah said, however, that the story was a fabrication. He said his Paniai-based staff had told him a crowd had gathered over an election dispute, relating to the local electoral commission's tardiness in announcing the names of local parliament members. He could not identify which election was being conducted at the time. People had been protesting for a number of days, he said, and had erected a picket outside the electoral commission office. Mr Rikas said when the police forced open the barrier on Monday [8 December 2014] morning, the crowd "ran amok", and attacked the police office, "so police asked the military to help them," he said.